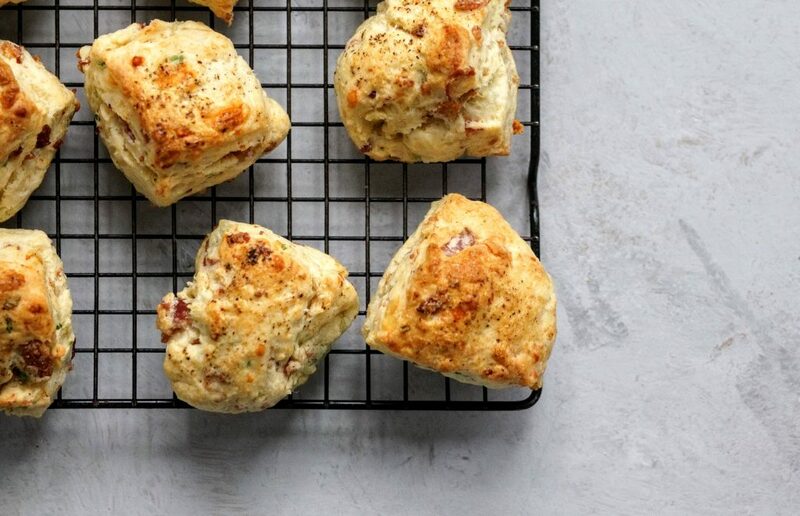 Prosciutto makes these scones stand out and an amazing savory treat. Let’s talk about Sunday morning…one of my favorite days of the week! Even though it’s the end of the weekend there is something comforting about Sunday morning, a certain sense of calm in the air and a final day to enjoy the family and whatever activities we have planned. It’s also one of the only days of the week I make a big breakfast. Most Sundays you’ll find us dining on waffles, pancakes and fruit (generally made by the kiddos!). Sometimes (if I get out of bed) I will whip up some scones along side some yummy eggs, coffee and fresh fruit. A favorite recipe of mine is these prosciutto cheddar scones with chives. These scones are so amazing, they are easily usable to bribe folks into pretty much anything you want (not naming any names here, you know you who are!) As with most of my recipes, you can vary ingredients and still achieve the same delicious taste. I have made these many times with bacon (which is equally delicious) and other cheeses. But there is something special about a dish that has prosciutto and really good cheese. We are a Tillamook family through and through. 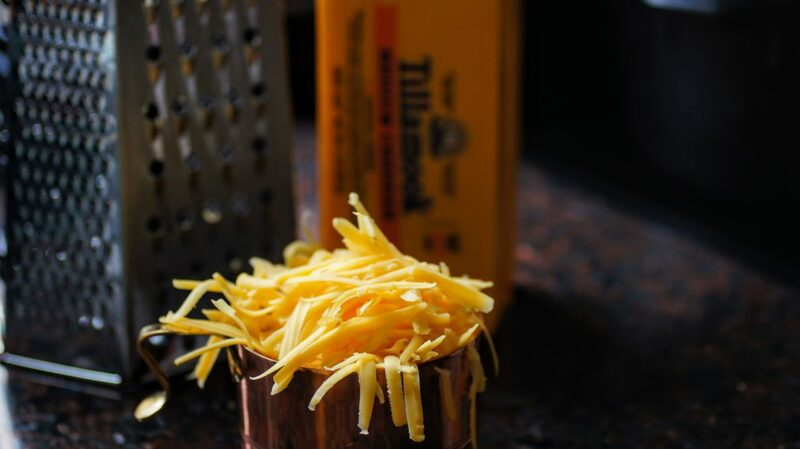 You’ll always find 1 or 2 or 5 blocks of Tillamook cheese in our fridge. It’s an Oregon staple and once you’ve tried it, you won’t be able to go back to your ordinary cheese. These scones are worthy of a ladies brunch, baby shower, bridal shower or just any given day of the week. 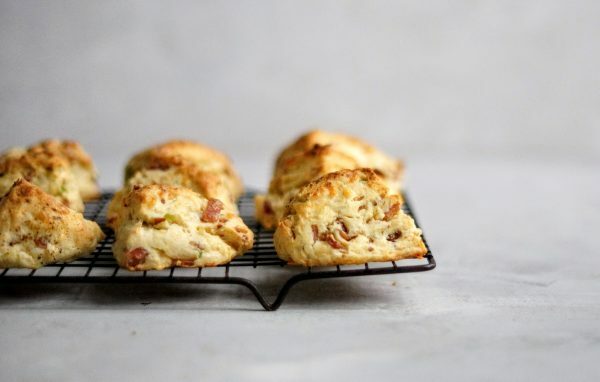 Making these on the weekend and stashing a few uncooked scones in the freezer can make for a wonderful weekday breakfast. ** With 3 kids, most school day mornings are busy just trying to get out the door. Let’s be honest, I can barely get everyone dressed, teeth brushed and shoes on (let’s not talk about the shoes!) so breakfast has to be easy and fast! If I whip some scones up over the weekend, I can easily pop a few in the oven while the herd of children shuffles to get ready. Is there anything better than a fresh warm scone? I think not! Check out the recipe and make some for your next brunch or while you’re prepping for the start of the school year! Your whole family will love them! I would love to see your creations! Tag me on Instagram @CosettesKitchen or post on my Facebook Page. 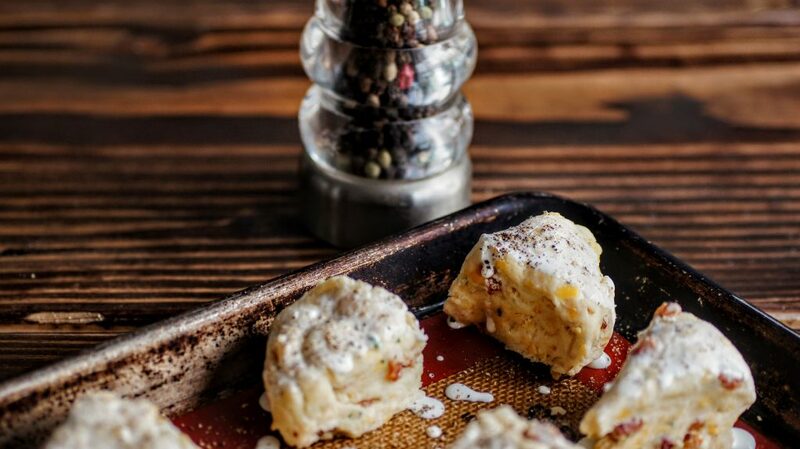 Black pepper tops these scones to give them a slight bite. These scones are sure to impress at any brunch! Place oven racks in the upper third of the oven and preheat oven to 425 degrees F. Line two baking sheets with a silicone liner or parchment paper and set aside. 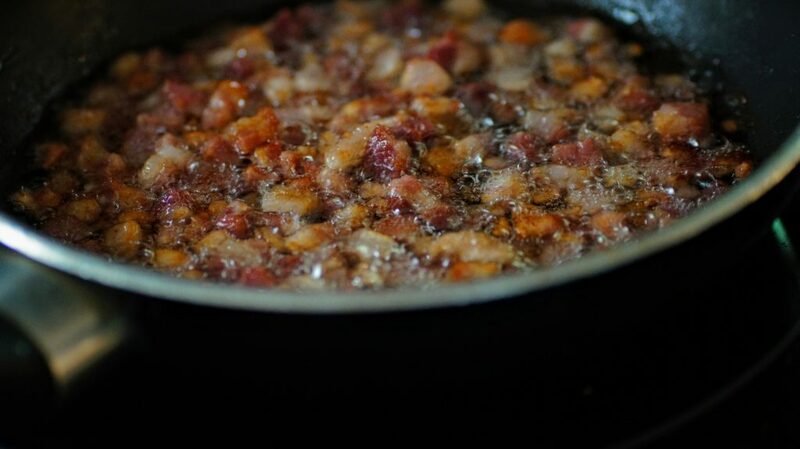 In a medium skillet, cook your diced prosciutto until cooked through. Remove and drain on paper towels. 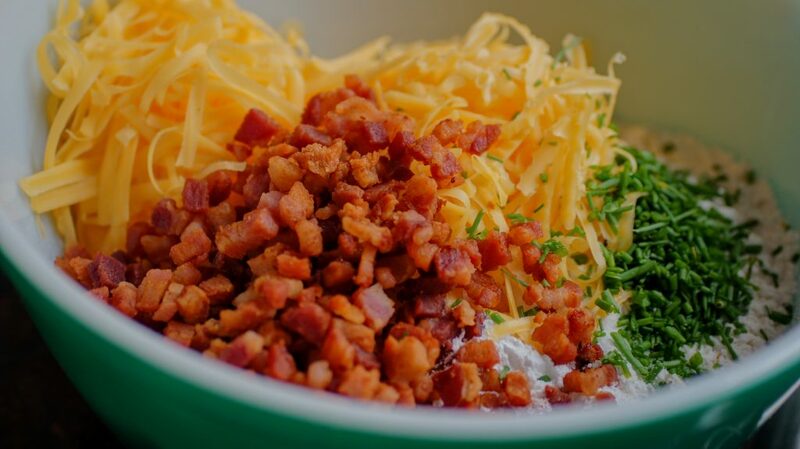 In a medium bowl, whisk together flour, baking powder, salt, chives, cheddar cheese and cooked prosciutto. Mix gently. In a liquid measuring cup measure 1 1/3 cups heavy cream. Slowly begin pouring the cream mixture into the flour mixture, using a silicone/rubber spatula toss gently until a cohesive dough forms. Add an additional 2-3 tbsp of heavy cream if needed. Dump the dough onto a lightly floured work surface. Gently fold the dough over a few times and then split into 2 disks. Bake for 18-22 minutes or until golden brown and cooked through. Swap trays at the halfway point to ensure even baking and browning on top. Remove from oven. Let cool on cooling racks and enjoy! I actually like to freeze my scones ALL the time! Even if it's just for 30 minutes to firm up a bit. 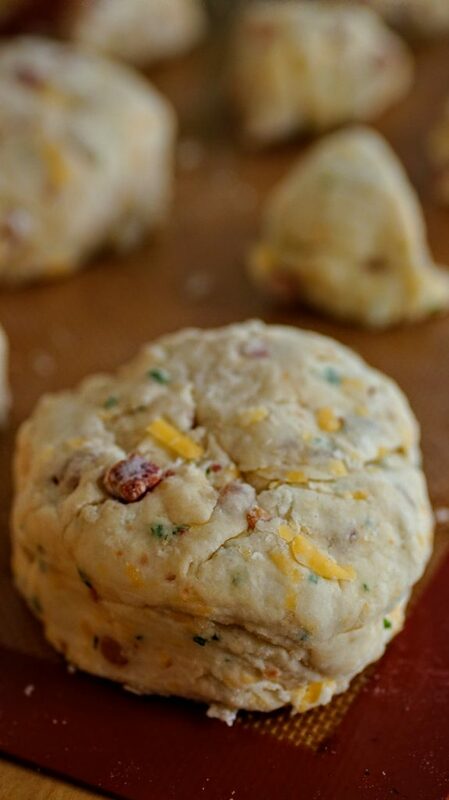 Freezing them helps to create a more tender, flaky scones as the gluten is loosened. Make ahead. Go through all the steps except baking and brushing tops. Once you have cut the scones, you can freeze on the baking sheet until firm then toss them into a ziplock bag to store. Anytime you want a fresh scone, pop into the oven, brush tops and bake! Feel free to substitute bacon for the prosciutto, prepare the same way. If you don't have fresh chives, you can substitute dried chives, same amount or feel free to use green onions. I love sharp cheddar cheese but any cheese you have on hand will from Monterrey jack to goat cheese! Feel free to experiment.